A report I share each month on the progress of my open portfolio of stocks and mutual funds with reasons of each and every stock that I own along with contract notes of trades executed in the current month and share important lessons I learn and plan for the coming month. Note: This is not my complete portfolio in the market and I may have open trading positions as well as some previous investments prior to Jan 2016 and other more riskier small and micro cap investments. I had no intentions to invest heavily in the month of September but made a big blunder when executing a trade and it has become one of the highest investment ever I have done till date. 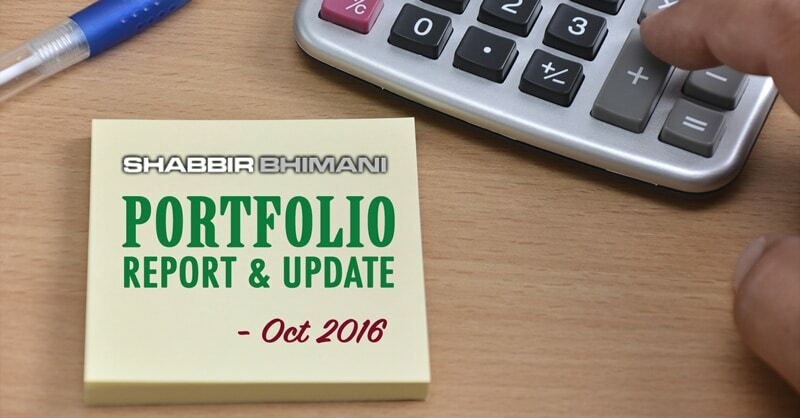 Though indices have not done much in the month of September, midcaps yet again has done wonders and so is the performance of my portfolio. Pidilite Industries is a new stock added to my open portfolio in September and though I only wanted to invest 1.4L in it, somehow in the closing hours of the trade, I placed an order of 2000 units instead of 200 units. Contract notes here. Next day I had to book a brokerage loss on 1000 units on the trade and came out of it but decided to hold 1000 units in my open portfolio. I follow my fundamental analysis principles for investing in any stock and Pidilite Industries is no different. Unique business and market leader in adhesive (Fevicol and Dr Fixit) business. Simple business which is to have more products for end customers that suit India’s growing need. number because you can have awesome business for year or two and then flat growth but a decade of growth at such a rate is awesome. The company has good dividend history. products and marketing. Dr Fixit can become a must ingredient for every constructions need. There is no debt in the company and has an awesome return of capital employed. Very high valuations and PE. It is currently trading at a PE multiple of 45+ which means lot may have been already factored into the price. Trading at 11+ times its book value. No debt, a market leader and unique blend of products will never be available at cheaper valuations but I preferred pidilite in such market uncertainty because from March 2015 to February 2016 when Nifty hit a high of 9119 and low of 6825, the stock had given only sideways movement with a peak of ₹640 and low of ₹520. Which means the stock has a very good resistance to fall and there is a lot of buying interest at lower levels even in the falling market. Top blue line around ₹650 shows breakout levels which is an intermediate support for the stock and 580 shows a very strong support for this stock and so ideally a close below 580 can be used as a stop loss but me being an aggressive investor will keep a stop loss of 520 which is even stronger support for this stock on a weekly chart. Increase in investment from ₹6,34,231 to ₹13,53,094. An increase of ₹7,18,863 in the month of September. Let us now see the performance of the portfolio built so far. I have learnt one of the biggest lesson of my investing career which is – Never invest when you have kids running around you because you are bound to make a trade which is not what you intended to do. Invest with a clear mind as to what you want to be doing otherwise market can punish you badly otherwise. If I was not holding 1000 units of Pidilite Industries, I may have purchased it close to 680 for sure and that may have been lot more profitable that what it is now. Have very little investment in L&T and I wanted to invest in L&T at around 1400 levels as well but then I could not because Pidilite has sucked up all my cash to invest any paise further. Not sure if I can get L&T again at those levels but will surely keep an eye on it. Tax Saving in the month of October for sure and I have already DSPBR Tax Saver fund and you will soon see my investment in it. I was prepared for correction in September, but I don’t see any correction in October and yet have no plans to book any profits whatsoever as of now.